This is the timeline list of proposed federal structures of Nepal before the constitution was promulgated in 2015. 2018 Feb 1-5: first meeting of all 7 states held in their respective states. 2017 Nov 26 & Dec 7: provincial election held for the first time in Nepal in all 7 provinces. 2015 Sep 20 Sun (Ashoj 3, 2072 BS): President Dr. Ram Baran Yadav promulgated the Constitution of Nepal in the last meeting of Constituent Assembly. 2015 Aug 21: After several protests in two weeks 3 major political parties (Congress, UML & Maoist) now agree on a new 7 states model. Three parties have combined 451 (75%) seats in Constituent assembly. 4th party from earlier agreement (Forum-democratic) opposed the agreement. The 6th state from the earlier "6-state model" is divided into two creating new 6th and 7th state. Salyan district from earlier 5th state is given to new state-6. One village (thori) from parsa district in state-2 is given to state-3. 2015 Aug 8: Four major political parties (Congress, UML, Maoist and Forum-Democratic) agreed on a new 6 states model. All new 6 states will have boundary with India. 4 states (except 2 Lumbini & Madhesh) will have boundary with China as well. 2015 June 9 : 16-points agreement between four major political parties (Congress, UML, Maoist and Forum-Democratic). They also agreed on 8 state model. But boundaries are not finalized. Maoist led 30-party alliance split. 2011 Nov 22: Baburam Bhattarai Government decided to from State Reconstruction Commission according to Article 138 of internal constitution of Nepal. It has given 2 months to give report. 2008 Apr 10 : First Constituent Assembly election. CPN Maoist, Nepali Congress, CPN-UML & MJF became 1st,2nd,3rd & 4th party respectively. 2008 Feb 28 : 8-point agreement (८ बुँदे सहमति) between Government and "Samyukta Loktantrik Madheshi Morcha" including MJF, TMLP, Sadbhawana Party (Agreed on Nepal to be Federal democratic republic and there will be autonomous Madhesh state). 2007 Jan 15 : Interim constitution of Nepal 2007 issued. 2006 Apr 24 : '19 days-Democracy movement of Nepal' ended, King re-instated the old parliament. 2002 Feb 28: Dr. Harka Gurung suggests "25-district New Nepal" as a new approach for decentralization. This article discuss all administrative divisions of Nepal implemented from unification era (18th century) to now. 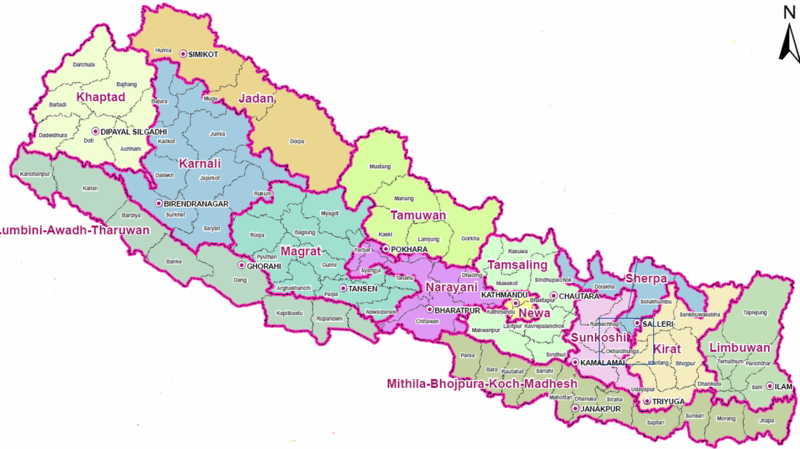 Administrative division of Nepal is recently been changed by promulgating the new constitution of Nepal in 2015 Sep 20. 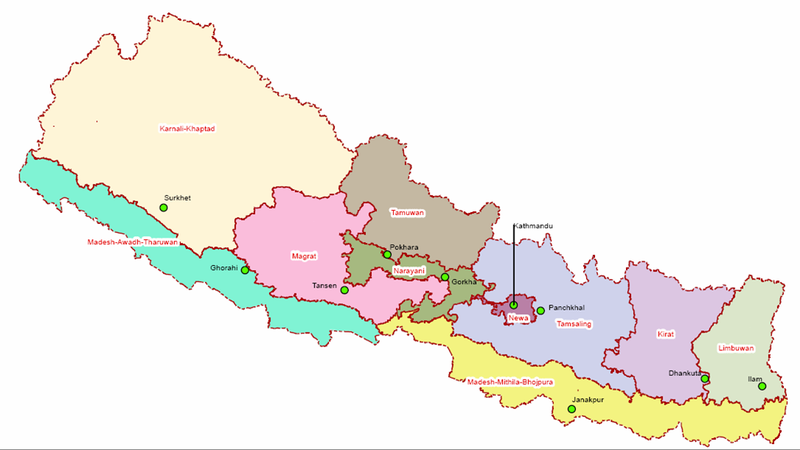 Click to see: New federal structure of Nepal and Proposed Federal structures. During King Rajendra Bikram and PM Bhimsen Thapa in 1816 A.D. Nepal was divided into 10 districts. All eastern areas from Dudhkoshi river was in one Dhankuta district. During the rule of Rana PM Bir Shamsher (1885-1901) Nepal was further divided into total 32 districts. There were 20 districts in hill and 12 districts in terai. Palpa and Dhankuta were the center (gaunda) of west and east. Terai districts used to be call Tahsil (तहसिल). Before Apr 13, 1961 there were 35 districts in Nepal. 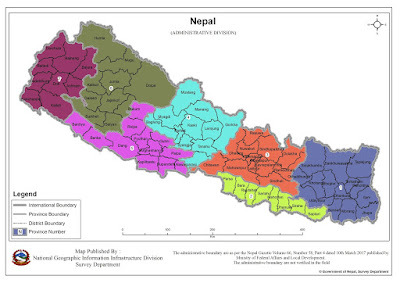 On 1961 (BS 2018/1/1) Nepal was divided into 14 Zones and 75 districts by King Mahendra. In 1972 Nepal was further divided into 4 development regions by King Birendra. And in 1980, the westernmost region was further divided in to two regions creating mid-western and far-western regions. In 1975 (BS 2032/8/26) Tibrikot (तिब्रीकोट) district was renamed as Kalikot (कालीकोट), because of which Kalikot district is also known as Kanchho Jilla (कान्छो जिल्ला, the Youngest district). During 1987 Local election there were 33 City Panchayat & 4,015 Village Panchayat in Nepal. Before the 2015 constitution, Nepal was divided into 5 development regions and 14 zones and 75 districts in nested-hierarchical manner. 75 districts were divided into City and Villages and each city and villages were further sub-divided into 'wards' ranging from minimum 9 (in vdc) to maximum 35 (ktm). For example- Mt Everest was situated in: Eastern Development region, Sagarmatha zone, Solukhumbu district, Khumjung V.D.C., Ward no 4. For 1992 Local election (according the new constitution of 1990) 36 Municipalities & 3,995 VDCs were created from old city and village panchayats. During 1997 Local election there were 58 municipalities and 3,913 VDCs. Until July 2011, Nepal had 58 municipalities & 4,915 VDCs. These municipalities were:- State 1: Damak, Mechinagar, Bhadrapur, Ilam, Dharan, Itahari, Inaruwa, Biratnagar, Khandbari, Triyuga, Dhankuta, Bhimeshwar, Kamalamai, State 2: Birganj, Gulariya, Malangwa, Siraha, Lahan, Gaur, Kalaiya, Jaleswar, Rajbiraj, Janakpur, State 3: Kathmandu, Kirtipur, Lalitpur, Bhaktapur, Madhyapur Thimi, Ratnanagar, Bharatpur, Hetauda, Banepa, Dhulikhel, Panauti, Bidur, State 4,5,6: Gorkha, Pokhara, Lekhnath, Butwal-Rupandehi, Siddharthanagar- Rupandehi, Nepalganj, Tikapur-Kailali, Kapilvastu, Byas-Tanahu, Putalibazar-Syangja, Ramgram-Nawalparasi, Baglung, Tansen-Palpa, Waling-Syangja, Narayan-Dailekh, Ghorahi -Dang, Tulsipur-Dang, Birendranagar-Surkhet, State 7: Dhangadhi, Bhim Dutta, Amaragadhi, Dasharathchand, Dipayal-Silgadhi. Govt declared new 41 municipalities in 2011 July merging 161 VDCs but not implemented. In May 8 2014 Government added 72 new municipalities (including already announced 41 and merging 283 VDCs together) making total 130 municipalities. In Dec 2014 Govt again added 61 municipalities making total 191 municipalities and VDCs reduced to 3,276. Though the new constitution was implemented on 2015 Sep, gov kept changing the old system. Govt added 26 more municipalities in Sep 2015 and 46 more in 2017 March making total 263 municipalities before the new constitution implemented for local level and after the constitution promulgated. 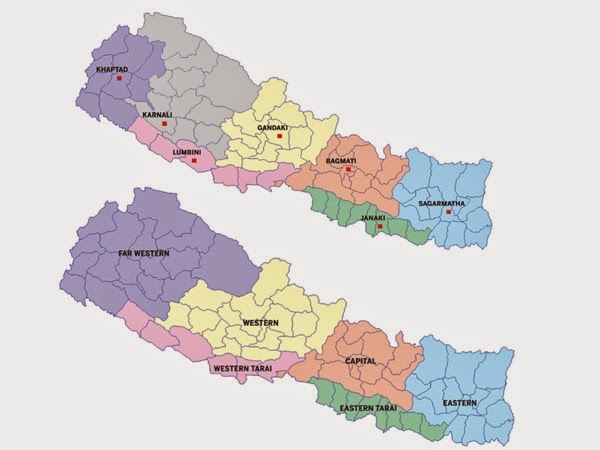 Provinces vs DR & Zones: Under the new system there are now 7 provinces in Nepal removing the old 5 development regions (DR) and 14 zone system. Districts: The old 75 districts are kept as it is except two districts (Nawalparasi & Rukum) are split. In 2017 Aug 21 Government recognized two parts of Nawalparasi & Rukum as separate districts effectively making total 77 districts in Nepal.